In average, I use knives in my kitchen at least four or five times a day. That's a lot, right? Yes, it is, and that is why I invest a lot of time and money into obtaining the best knives on the market. There are some knives in my kitchen drawer that go way back to my wedding day and even to the days when I was single. I love them for their quality, but eventually, all of them tend to lose their edge sometimes. Just a couple of days ago my husband’s colleagues came for dinner and I wanted to prepare Beef Bulgogi. However, it is a very delicate recipe to prepare, since it requires paper-thin pieces of meat, and it is impossible to achieve that without a sharp knife. I’ve picked up my favorite chef’s knife, and boy what a disappointment it turned out to be. Luckily, I had a manual knife sharpener somewhere in the pantry. Imagine what would happen if I didn’t. This event made me realize that I need to have more efficient knife sharpening tools up my sleeve. So, I’ve started searching, so that you don’t have to. However, you should still go through a couple of buying tips so that you can know how to decide when the choice comes down to five. After that, I’ll present you my humble judgments about five best knife sharpeners you can find these days. What Should A Quality Knife Sharpener Have? What Is The Best Knife Sharpener Money Can Buy? First and foremost, before you even start going through knife sharpener reviews you should know what type of knives you have. Straight-end blades can be sharpened with basically every knife sharpener, but if you own serrated knives, you will have to be choosy. Also, be aware that not every sharpener can sharpen Asian-style knives (and I have plenty of those), sport knives, scissors or knives with a narrower edge than a standard kitchen knife. If your kitchen is home to some of these blades, make sure you find a sharpener designed to handle them. I also have steak knives, carving knives, meat cleaver and ceramic ﻿knives, you can check them out. Yes, this is a thing too. For example, even a top knife sharpener couldn't work for me if it is very noisy. Some electric sharpeners tend to produce a lot of noise, but on the other hand, most electric sharpeners get the job done faster than any hand knife sharpener. So, it’s your choice – can you make that compromise for speed? You should also consider your budget since manual sharpeners are usually much cheaper. I’ve already mentioned above that there are manual and electrical sharpeners, but there are also knife sharpening systems. Even though we live in the days when everything that is not infused with electricity is obsolete manual knife sharpeners are holding up pretty well, probably because they can be just as efficient as electrical ones. They are using whetstones to grind fatigued metal and sharpen the edge without the help of any devices and angle stabilizers in effect, just plain old muscles. Some people dislike even the best manual knife sharpeners because they think they require too much effort. Indeed to be able to sharpen the knife efficiently you will need a steady hand and a lot of practice. On the other hand, electric sharpeners are praised for their speed and ease of use. In fact, many people would agree that the feature “electric” usually means the easiest knife sharpener. However, I have two problems with these machines. One is that some of them are really noisy and annoying. The other is that some of them can over-grind the edge of the knife and reduce the lifespan of the blade. Also, if the electric sharpener is generating a lot of heat while working it can cause wrapping and chipping. Finally, knife sharpening systems are guided precision devices that contain diamond or grit stones, polish tapes, angle adjustment, etc. They are very easy to handle. All you have to do is to hold a knife and drag it back and forth against a stone. Since they consist of several parts, they usually come in boxes, so be prepared for them occupying substantial space in your kitchen. Good performance is the most important feature. You should judge a sharpener by its ability to produce a consistently sharp, smooth edge without any scratches or nicks on it. Hard, abrasive surface is what enables the sharpener to be efficient and fast. Diamond is the hardest, and it’s followed by tungsten carbide and polished ceramic. Abrasion is measured in grits, and you should always go for about 1000-grits. Adjustable angle guide will make it easy for you to hold the blade at the correct angle which is especially important if you are a beginner. Multiple sharpening stages are a must since some knives require only polishing and touch-ups. Safety features, such as a physical barrier between the knife and your fingers should be on the top of your priority list. Now that you know everything you should look for in a knife sharpener, and everything you should consider before the purchase, I can move on to presenting you with top knife sharpeners on the market. This baby is advertised with a bold sentence: “100% satisfaction guaranteed or you’re going to get your money back”. Well, I’ll tell you one thing, I wouldn’t ask my money back because it is certainly competing to be best manual knife sharpener money can get. The first thing that got my attention is that it can be used to sharpen several types of knives (serrated as well), including scissors, but that is not the only thing this knife sharpening tool has to offer. 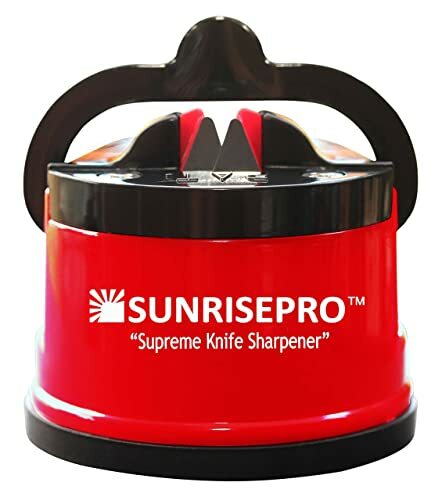 The SunrisePro can brag about a professional-grade diamond-coated precision slots that can position the knife into a perfect sharpening position. One of its most useful features is the powerful suction cup pad that can fix it securely on the countertop, which makes using it very easy and safe. Its size makes it very portable, so I can carry it with me when we are going camping or when I’m cooking dinner at my friends’ house. If I could name one thing that is bad about this knife, the first thing I would say is the short lifespan. When I first got it, it worked perfectly. However, after a couple of weeks, the sharpening stones on the sharpener had worn out. Also, although I was pretty impressed when I read that it can sharpen scissors, it turned out that that was not really the thing. So, I guess I can say that, although a really fine product, it doesn’t live up to the hype. Moving on to electrical sharpeners, Presto 08800 falls into the category of rather good knife sharpeners. Coming from National Presto Industries, Inc., this sharpener is a true eye-candy. The black-silver color combo perfectly fits into modern ﻿stainless steel﻿﻿﻿ style kitchens. As the previous sharpener, this one also boasts suction cup (only X3) that provides stability during the sharpening. The two-stage system (rough and fine stage) ensures the knives come out sharp every time. Considering it is an electrical sharpener that uses 120v 60 watt power, the price is pretty reasonable. When I first got my Presto 08800, I had no idea how to use it, and to be frank, it looked really tricky. However, after some time, I’ve got used to it. The trick is to maintain light and even pressure throughout the process and don’t press down on the blade. As with any electrical sharpener, the risk of over-grinding the knife is there. And there is the thing with the downright annoying noise it makes while sharpening the knife. Looking for good knife sharpeners? Stick around because you might be in it for a best knife sharpening experience yet. PriorityChef stands out with completely safe gripping, two sharpening slots (course and fine), and attractive design. It may not own a suction cup, but it does have a non-slip base, which does its job quite well. It is a quite efficient appliance that can transform any blunted knife into a razor-sharp one. The accuracy is amazing. PriorityChef is very easy to grip, and I must say that the handheld framework feels so safe that I can with all faith allow my sons to use it. The two phases of sharpening are quite efficient. In the first phase, it is enough to run the knife twice or thrice to get the desired result. As for the second one, it is very important to pursue the directions properly. If you do that everything should be fine. As for the downsides, it bothers me that it can’t be used to sharpen serrated or ceramic knives, but no appliance is perfect, is it? Let’s start with the elephant in the room here, this knife sharpener isn’t exactly a part of your best knife sharpening kit, most notably because it seems very unsafe, but it just might be the best cheap knife sharpener on the market. With a price as this low, you can’t expect ideal design and ease of use, but for what it is, it does a pretty decent job. As I mentioned, it seems very unsafe, since you have to hold it with one hand (and there is no handle) and pull the knife through with the other. It does have non-slip rubber feet as insurance, but it is still really unstable. However, if you would look the name behind the game, you would see that Smith’s has been a trusted name in the sharpening industry for over a century. This is probably the reason why (once you get the hang of it) the sharpener works pretty efficiently. A great benefit of the product is that it occupies little space and that it fits in a handbag. 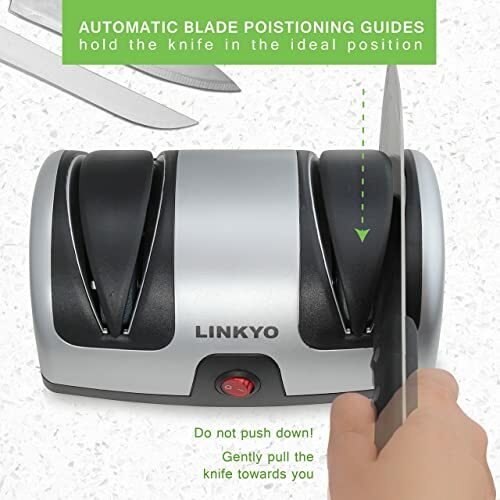 Another electric kitchen knife sharpener on the list, Linkyo offers many perks every housewife would wish for. It is safe, fast and simple to use. The best thing about it is the automatic blade positioning guide which secures the knife in the appropriate position. As some of the previous entries, it has two stages of sharpening with the first one sharpening and the second one polishing the blade. What I find its greatest advantage, besides the positioning, is the ease of cleaning up the metal shards by simply removing the plugs. 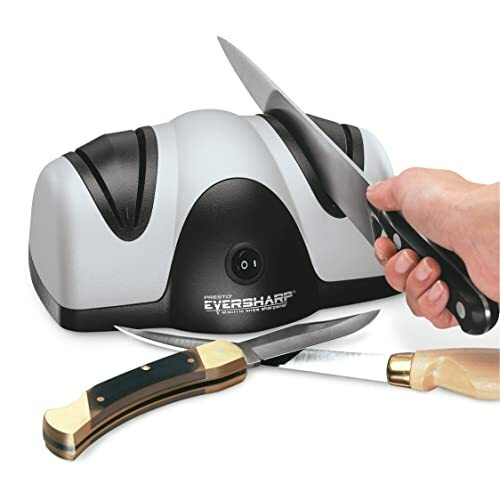 For a top rated knife sharpener which is also electric, the price is decent. However, this is obviously not world's best knife sharpener, and it comes with some flaws. First of all, it is not designed for serrated blades. Second, you can’t adjust the angle of the blade. It seems to me that the motor is also pretty weak and that the sharpening disks are a bit unbalanced and uneven. Well, it is a pretty hard decision to make. You won't make a huge mistake with either of these sharpeners. If you're asking me, remember what I mentioned in the buying guide about your own preferences. I don't like electric sharpeners very much since they have the tendency of eating away the blade and can be very noisy, so Linkyo and Presto are on the bottom of my list. 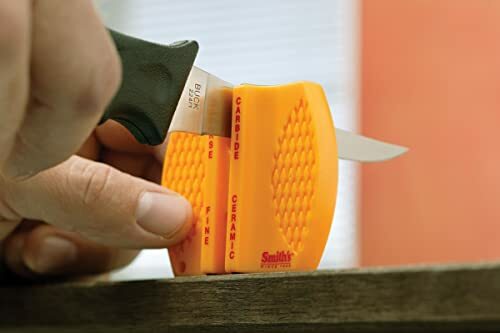 As for the manual sharpeners, the Smith’s seems unsafe, and SunrisePro can't last for a long time. 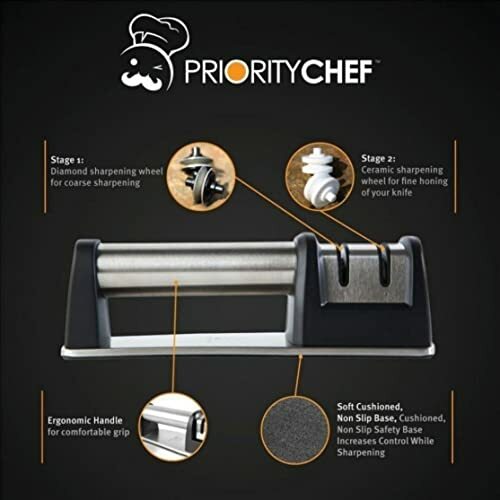 So, the winner is, obviously, PriorityChef Knife Sharpener. It is designed splendidly; it is safe, trustworthy and efficient. Although it doesn’t excel with all types of knives and the second phase of sharpening requires a delicate touch, all in all, it does its job excellently, and it is a great appliance to have.